I've been reading about Sri Lankan cuisine lately. I tried a couple recipes and finally decided to take the plunge and make something myself. This curry is a fusion of different influences. I wanted to use marinaded, fried tofu. I would be using a lot of oil to fry the tofu, so I used soy yogurt instead of coconut milk to save calories. I added coconut water to get a little of the coconut flavor and some sweetness. Finally, I added cabbage to the stir fry. The sweetness of the cabbage and the yogurt's tartness nicely complemented a very pungent curry powder. Sri Lankan food is traditionally very hot. This is not. The day before, mix together the curry powder, soy yogurt & salt. Place the tofu slices in the marinade, making sure the top has a slurry of marinade. Leave in the refrigerator overnight, turning a couple of times. Heat the oil in a large fry pan over medium-high heat. Add a little more if it doesn't cover the pan. Scrape the yogurt off of the tofu slices and fry in the oil, turning once until both sides are browned. 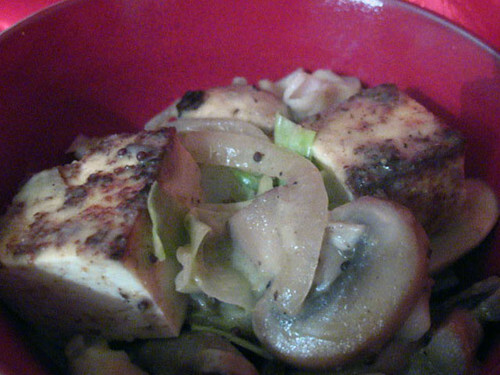 Remove the tofu, cut the slices into cubes and set aside (preferably in a warm oven). In the same oil, add the mustard seed. When they begin to sizzle, add the onion and saute until soft. Add the mushroom and continue sauteing until the mushrooms have given off most of their moisture. Add the ginger batons, stir fry for a couple minutes, then add the cabbage. Saute just until the cabbage wilts. Stir in the yogurt marinade, coconut water and the tofu. Bring just to a boil and simmer until the tofu is heated. Serve over rice or with naan, chapatis, etc.